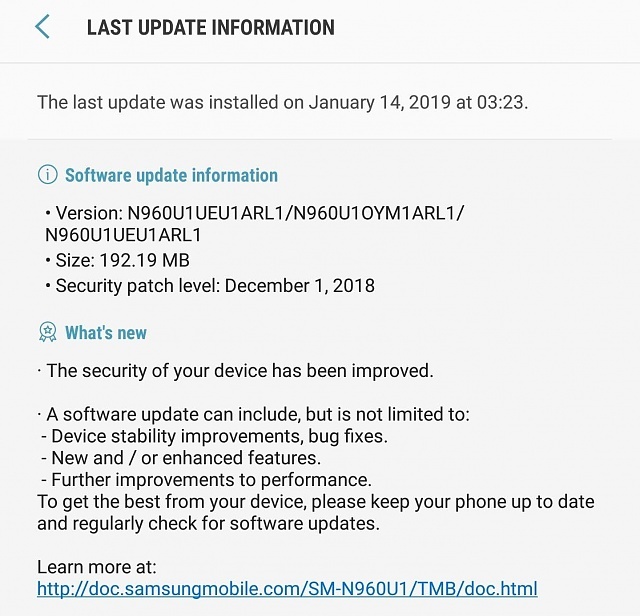 The N960U1UEU1ARL1 firmware update (with the Dec 1 security patch) was released today for the unlocked T-Mobile Note9 (N960U1), just a week after it was released for the T-Mobile branded Note9 (N960U). The release notes mention only security improvements, but the EU1 (as opposed to ES1) in the firmware version indicates that it's not just a security update. jimd1050 and kevinpleasants like this. How do you know that? And why then is there an EU1 instead of an ES1? In general, it's far more helpful if you say how you know something instead of just making a claim without giving us any way to tell if it's true or false. because if it were the Pie update it would be around 1.8gb. that is just a security patch for oreo. you can look them up on firmware.science. because if it were the Pie update it would be around 1.8gb. that is just a security patch for oreo. Obviously it's not Pie, because it still says Android 8.1.0. But that doesn't mean it's just a security update. Occasionally a firmware update is just a security update, but usually there's much more to it--features and fixes unrelated to the Android Security Patch Level. And sometimes there are firmware updates that don't include a new security update at all (for example, for the T-Mobile unlocked Note9, the ARH2 firmware in August and the ARH4 firmware in September both had the Aug 1 security patch level). you can look them up on firmware.science. This firmware version isn't listed there. Perhaps forthcoming. well, it should be listed in about this update. if it were anything other then a security patch. usually its generally pretty vague on what exactly they are pushing anyway. but usually when it comes thru Verizon they at least mention what else is being done. but usually just says "may" contain bug fixes. well, it should be listed in about this update[,] if it were anything other then a security patch. See this long board about the camera freezing issue that many are having and the last two pages talk about the ARL1 update for TMO and how the two who have installed it no longer have the freeze issue with the camera. Hopefully that's the case. Thanks, yes, that's why I was interested to confirm that the unlocked TMo ARL1 update isn't just a security update. anyone using on TMO yet?